I don’t remember when I actually stopped attending church, though it was sometime during my sophomore or junior year of high school. What I do know is that I spent more time in a church today than I have in probably four or five years combined. In fact, I think I hit about one church for each of those years. I ventured out with Gabby and two other girls in our class, Melanie and Carolyn. Our first stop was St. Ann’s, a 300-year-old Anglican church. We took some pictures out front and I noticed one of the giant bright red doors opened in front of us. Had the peculiar verger Derek not popped his head out, I might’ve thought the Holy Spirit itself had eased the door open. To me, the lanky Derek looked pretty haggard but had piercing eyes. He was dressed in an odd combination of clothes – a striped shirt and tie under a patterned vest, covered by a big blue robe with his nametag on the front. Hanging over his robe was his curly brown hair, and covering his face was something that resembled a 10-o-clock shadow. 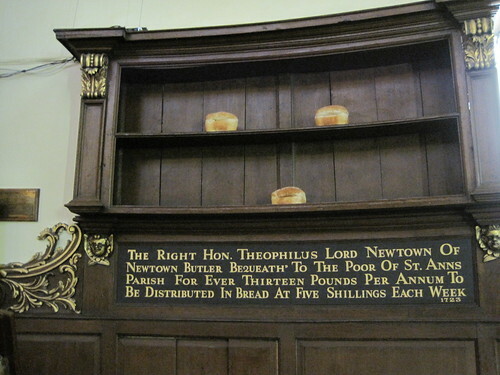 I was surprised when he offered a lot of history right away, how the church apparently became famous for offering loaves of bread to the poor and a little synopsis about some of the people that were buried here. 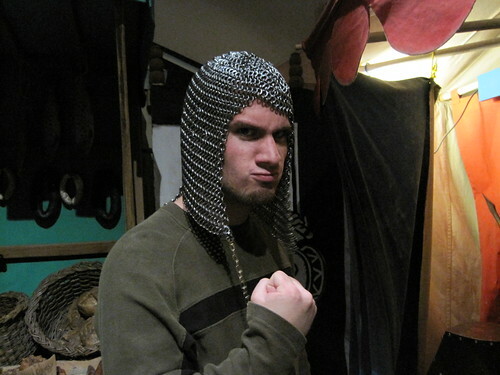 After handing out a few poems and rattling off some history, Derek encouraged us to go inside. 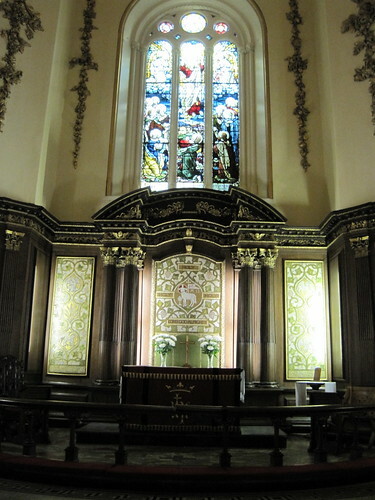 Since the Anglican Church split from the Catholics, it was no surprise to me that there would be ornate decoration and detail in the architecture of the building. Poem tablets were hung on various locations along the wall and other plaques told us these were where a particular person’s “mortal parts” lay. The lectern was accessible only from a rounded flight of stairs. The altar wasn’t that big, but had lots of painting and inscriptions. We took some pictures and observed the work inside the church undisturbed until two other people came in. 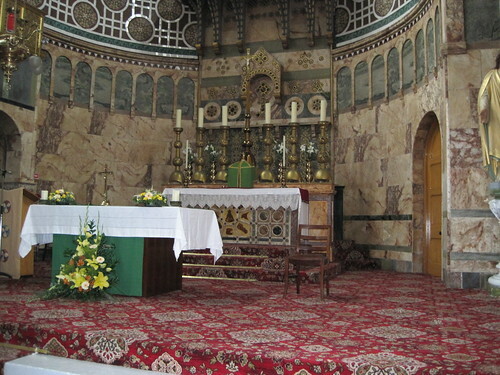 They quietly looked at the church’s altar and lectern. As the four of us walked to the back, I noticed Derek staring in and reminding me a lot of any of the scenes in Office Space where Milton pops his head out to sneak a peek. Honestly, it kind of freaked me out. After St. Ann’s, we eventually wound up at the Catholic Newman Church. There were no lights in the nave, or the main part of the church; it was lit entirely by sunlight, which was nil this morning on account of the clouds. This church was a lot bigger on the inside than it looked outside, and offered lots of color and lots of paintings. In every Catholic church I can remember ever being in, the Passion of the Christ has been displayed on the wall, usually by painting. This Passion was carved from wood and was rounded. The pews, however, were not so great and looked like something even I could construct – just a few pieces of wood banged together to make an uncomfortable place to sit or kneel during Mass. I tried sitting in one and was worried I would knock the whole thing over. There was no guide here, so this trip was pretty quick after pictures. 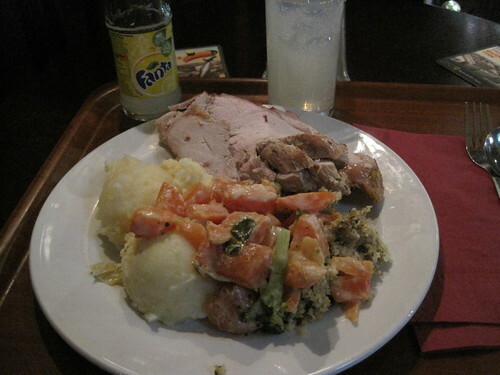 After walking down Grafton Street to a downstairs grocery store that looked a lot better than the Metamora IGA, which boomed with customers under a department store, Gabby and I separated from Melanie and Carolyn to hit O’Neill’s for lunch – turkey, mashed potatoes, dressing, and carrots was like a Thanksgiving in May…in Ireland – and then Christ Church Cathedral. A lot of Christ Church was starting to look the same after having seen two churches already. The only major difference between the churches we’d seen and this Protestant church was that this one was a lot bigger and charged an entrance fee. Downstairs were tombs and crypts, as well as a mini-museum of artifacts from the 1600s and the King James II era. Gold plates and other items from King Williams III’s reign were also underneath the church. 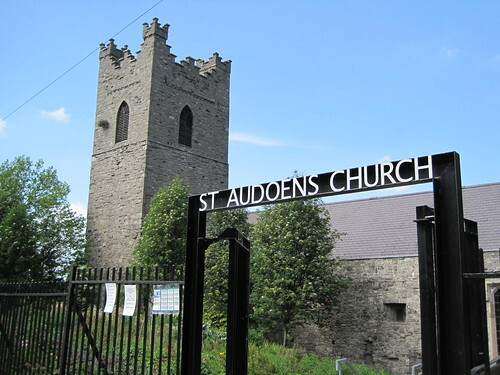 When we left Christ Church and Dublinia – a three-story museum of Viking and medieval Dublin offering my inner 8-year-old lots of areas to interact with – we walked down the road to hit St. Auoden’s, our final church. I noticed the wind picked up right away after walking through the entry gate and I made a remark about how the Holy Spirit had descended upon us. I walked right in, snapping pictures right away because I don’t always pay attention to directions the best. As I was up near the front of the church looking for good shots behind a lady kneeling at a pew in front of a row of burning candles, Gabby informed me that I wasn’t supposed to be doing what I was doing. On the way out, I noticed there was a tiny sign that made mention of it. I don’t remember what it was called exactly – I want to say exposition – but the gist is that Christ was supposed to be present in the church, and I was photographing Christ. Maybe the Holy Spirit had transitioned from just the wind to having possessed the angry blue jay I noticed flying around near the arched roof on our way out. After hearing about Gabby’s non-religious upbringing, I would quiz her throughout the day on facts I remember from my days in CCD. Who elects the Pope? What does the smoke represent? What is the color of the smoke? Do you know what a confessional is? That’s the tabernacle, where the priest prepares the Eucharist. Et cetera. I was pretty surprised with how much I remembered about churches, from the beliefs I learned in CCD to the architecture and history through my high school humanities and college religion classes. 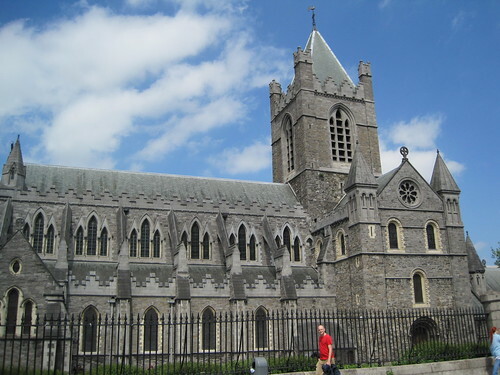 Even though I don’t worship, I understand religion is a major part of the world in which we live, especially here in Dublin where there seems to be a church on every block.